. 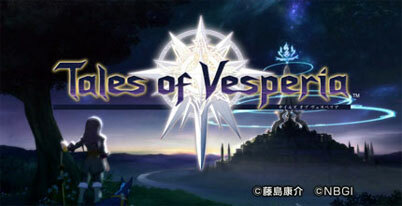 : Tales of Vesperia :. Home / Xbox 360 game manuals / Tales of Vesperia :. Tales of Vesperia manual Just click to open it in a new window then print the manual. Tales of Vesperia radiates beauty. This role-playing game's most obviously inspired facet is its vibrant visual design, but even if you were to overlook its pretty exterior, you'd find more beauty tucked away in almost ever corner. The characters are vividly crafted, the dialogue rings truer than you'd expect from a Japanese RPG, and the involving story is intricate without becoming overwhelming. Of course, Tales of Vesperia is a game, not a film, so you'll be delighted to know that it's also a long, entertaining journey filled with flashy combat and all the gameplay elements fans of the Tales series would expect. It might feel a bit overfamiliar at times, but by tightening up the battle system and keeping the pace brisk, the developer has produced a truly great sequel that any RPG fan can get into. The game's star is Yuri, a well-meaning troublemaker living in the capitol's lower quarter. Devices called blastia manage the world's magic needs, from monster barriers to mystical weapons. When a thief steals the core of the blastia that regulates the neighborhood's flow of fresh water, Yuri sets off to recover it, only to find himself caught up in a game of politics and class struggle. As he treks across forests and deserts, Yuri and his trusted dog Repede bring various friends into the fold. There's the naive Estelle, a castle noble who finds she has the most to lose--and the most to gain; Or the insufferable Rita, a headstrong magic researcher who keeps getting drawn into the drama in spite of herself. One by one, the core cast builds, yet each character possesses unique charms, and you will care about their struggles. This may be a simple variation on the genre's prototypical journey of self-discovery, but the terrific cast keeps the story fresh and fascinating. Even small touches, such as the end-battle celebrations, brim with charisma.